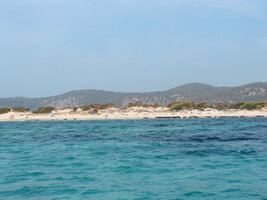 Location: 10 minutes by car from Playa d'Embossa or 15 from Ibiza. Services: Sunbeds, restaurants, parasols, bars. Officially nudist Beach protected by dunes of sand and a green belt of mounds. When the wind blows from the east produces big waves, ideal for surfers. 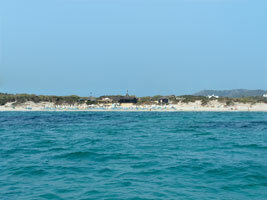 The dunes spread over the whole beach, being an ideal place to sunbathe. In the summe months, it turns a meeting point for homosexuals of the whole world. To the bottom of the beach, there is a stall (chiringay) with music disc and coctails, obtaining an environment of party during the whole day. Services: Two exclusive restaurants at the end nearest to Ibiza. Towards the other end there is a bar and gay very popular restaurant opened in the summer months. 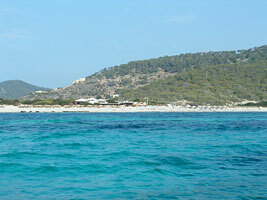 Getting there:By car, bicycle, or bus from Ibiza (10 km) or Playa d'en Bossa (6 km). During the high season it is extremely complicated to find parking, for what it is advisable to go soon.